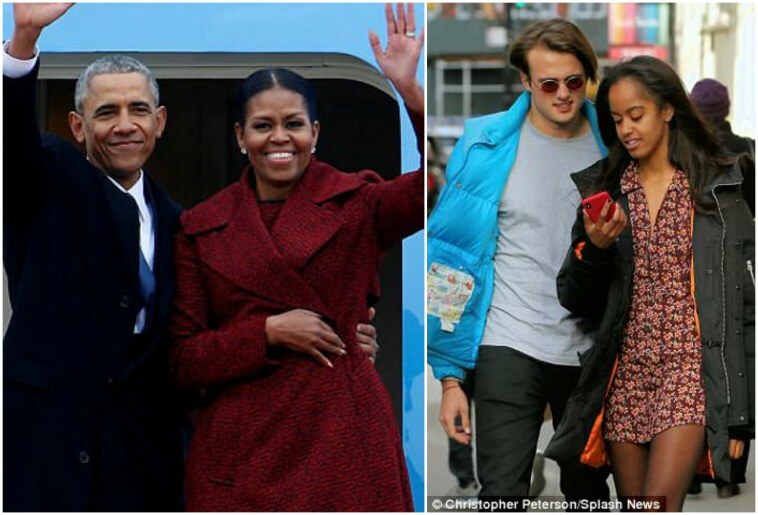 Barack and Michelle Obama are such a polite pair, they’ve sent a letter to their daughter Malia’s posh new boyfriend, Rory Farquharson, to apologise for being so famous, Daily Mail reports. Malia, 19, and Rory, 20, have been an item since they met while studying at Harvard University last year. The Obamas are said to be concerned about the attention their daughter’s famous name might bring upon Rory – a former head boy at top public school Rugby – and his family. Daily mail reports that Rory’s parents, Charles and Catherine – who live in a £1.6 million house in Suffolk – are telling anyone who will listen about their son’s exciting correspondence from the former US President. In fall 2017, footage of Obama smooching another Harvard student at a football game leaked to TMZ. The Daily Mail quickly identified the student as Rory Farquharson, a Harvard sophomore from the UK. In the video, filmed at the Harvard v Yale American football game, Malia is seen smoking a cigarette and smiling before putting her arms around Rory before going in for a kiss. Rory couldn’t quite take his eyes off his pretty girlfriend, while both kept themselves shielded from the weather in their designer winter coats.